Georgia knows she's ’fat’ but doesn't think that gives people the right to bully her. 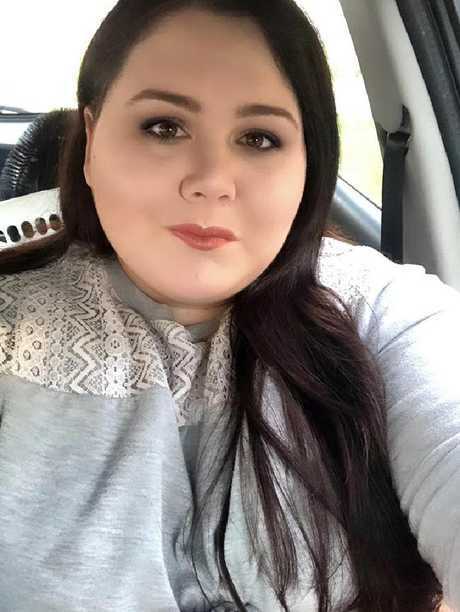 Georgia Rochelle, 23, is no stranger to negative comments about her body, but even she wasn't expecting the "fat-shaming" comments a Kmart customer service representative sent her in a "disgusting" email. 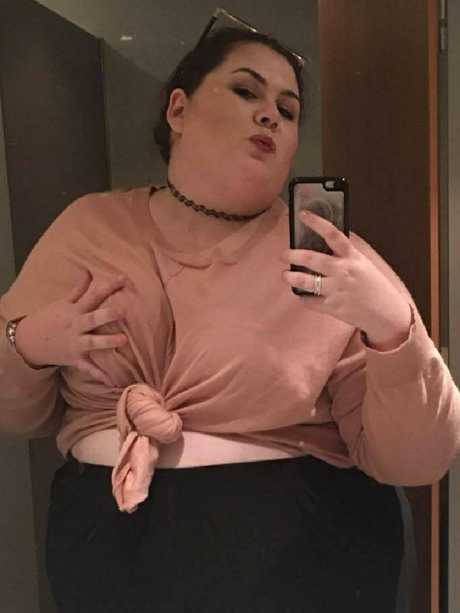 Georgia had been searching for the plus-size section in her local store and was disappointed to find it consisted of "half a rack of ugly clothes" concealed behind rows and rows of smaller size clothing. 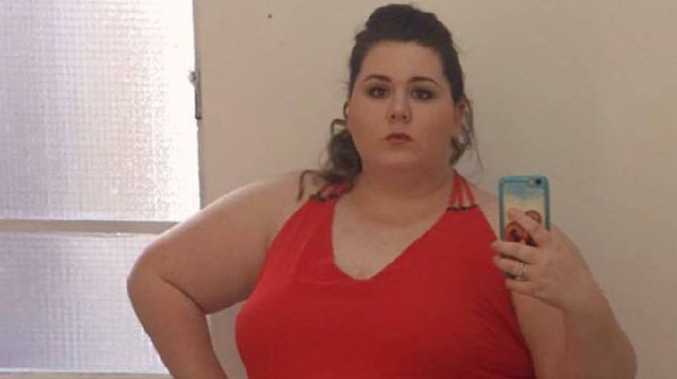 When it came to activewear, there was nothing that would fit her at all, so she decided to message Kmart's Facebook page to voice her complaints. Initially, she received a welcoming response, asking for more feedback to improve Kmart's range. But when a follow-up email came early Monday morning, she was sickened by what she read. 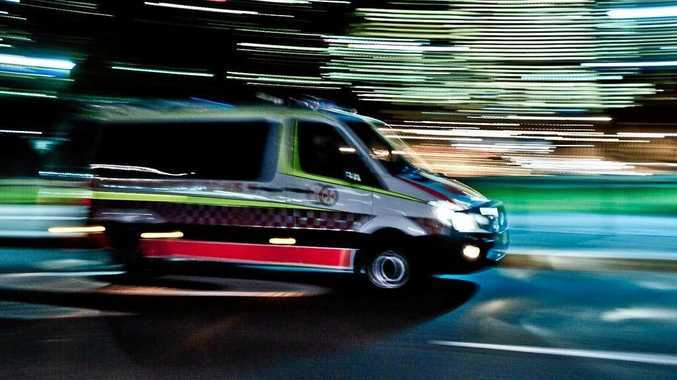 "While we try to cater for as many people as possible please understand people come in all shapes and sizes and we can't cater for absolutely everyone," a customer service representative wrote. "It is not entirely our job to make you feel good about yourself." 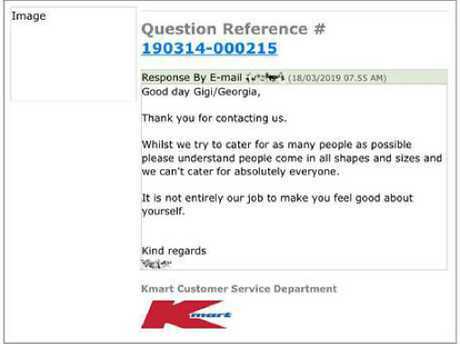 Kmart's 'disgusting' email to Georgia. "Honestly, I was shocked," Georgia told news.com.au. "I asked a simple question and his words made me feel like I was in high school again." Georgia says she does feel good about herself. In fact, she loves her body, and all it's done for her. She's not embarrassed - she's angry. "It's so insulting I can say something about there being a limited range for plus-sized people, and they acquaint that with feeling bad about my body, which isn't the case at all," she says. "I don't think your size is something to be embarrassed about. All it shows is that prejudice (against fat people) doesn't go away - even when you're supposed to be professional." "That is so beyond not okay!" one person commented. "It's not even got anything to do with not feeling good about yourself. It's literally about not having anything to f***ing wear because big companies only care about selling straight-sized clothes." "You don't deserve any of this. All you wanted was to know where to find your size." Some, however, took the post as an opportunity to make fun of Georgia's size - something she's used to but has zero tolerance for. "Stop pretending it's our health you're worried about," she says. "If you really cared about our health, you wouldn't be making disgusting comments, and you'd take mental health into consideration. Someone else's health is none of your business anyway. "Let people live and let people feel good about themselves. Stop assuming that fat people hate themselves, just because you think we should." Georgia was ‘disgusted’ by Kmart's response to her complaint. "We are truly sorry for these comments and have spoken directly to this customer to apologise. This does not reflect Kmart's views at all. We want every customer that interacts with Kmart to have a pleasurable shopping experience, and on this occasion, we have not lived up to this commitment." "I've had strangers stop me in the supermarkets and tell me I'm going to die because of my size, completely unsolicited," she says. "It's not about 'promoting obesity'. It's about treating others with respect and kindness, recognising the blatant hatred overweight people face on a daily basis. It costs nothing to be kind. "All I'm doing is existing as a fat person and asking to be respected as a human being." 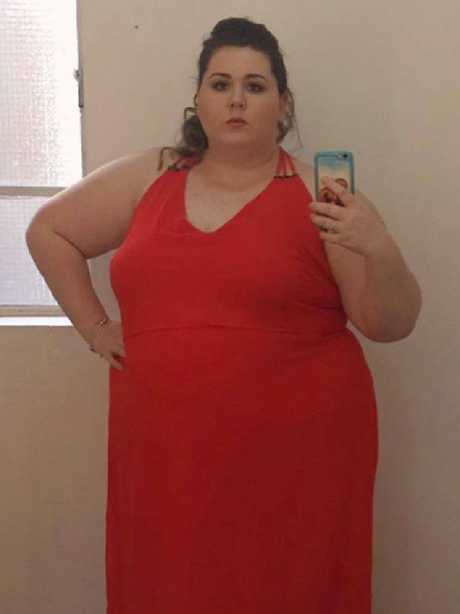 Georgia says that since raising her concerns, Kmart has offered her a personal apology and invited her to join a special focus group to improve the brand's plus-size range - which Georgia intends to do. "Fat people deserve better," she said. "It's 2019. Let's have clothes that make us feel good and happy." Georgia hates that everyone assumes she dislikes her body when she is proud of it.